Hasbro has some really cool GI Joe exclusives for Comic Con as well. Following up with last year’s Starscream/Cobra Commander team up, the toy company has some more fun stuff uniting Cobra with the Decepticons. 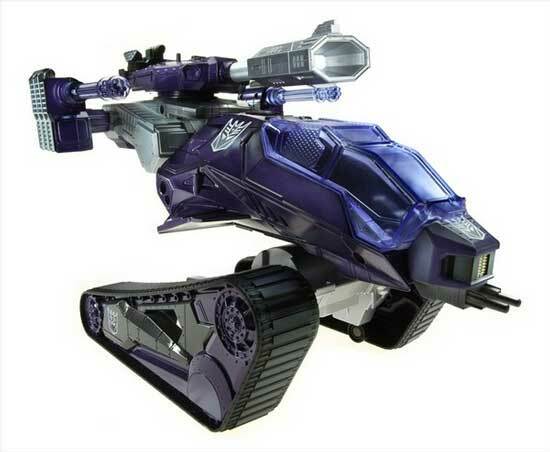 They are offering a modified Cobra H.I.S.S.–basically a souped up attack tank–that uses a plasma cannon as its main weapon. And that plasma cannon happens to be none other than the evil Shockwave in his non robot form. The vehicle is decorated in his color scheme of purple and grays. The vehicle will come with two 3.75″ figures. It makes sense that Destro would team up with Shockwave, as they are the second-in-commands of their respective organizations. It also comes with one of Cobra’s robot B.A.T. soldiers. While neon green and purple might not be the best color choices for the battle field, these colors pay homage to the Constructicons. If it works for a gang of construction vehicles that turn into the menacing Devastator, its good for Cobra’s disposable soldiers. What also is really amazing about this set is that it comes with Energon cubes (scientifically speaking, food for Transformers) and a scaled down Soundwave in his cassette player/boombox form. I’m really hoping that Hasbro has this available for purchase after San Diego. 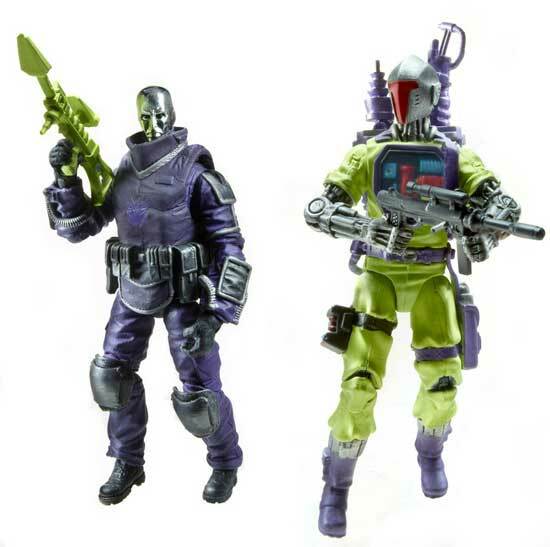 Hasbro will also be selling two versions of GI Joe’s lady ninja Jinx, one in her traditional red look and the other in her GI Joe Retribution look. This entry was posted in Uncategorized and tagged cobra, destro, exclusive, gi joe, hasbro, san diego comic con, sdcc, shockwave, toys, transformers by Chris. Bookmark the permalink. I would probably dedicate a week of posts to this HASBRO exclusive if i owned it. Is that a Decepticon insignia on Destro’s vest?Too cool.The one movie that could have given the Avengers a run for their money is a Transformers/G.I. Joe crossover.Heck i even thought a Battleship/G.I. Joe crossover would have been cool,too. Transformers/GI Joe would be awesome! i know you have connections in Hollywood so get it done!